When hoisting large size steel palte, more than one lifter might need to combine. Simply hook to your hoist or crane and you’re ready to go. Lifting awkward and heavy loads becomes a one man job. 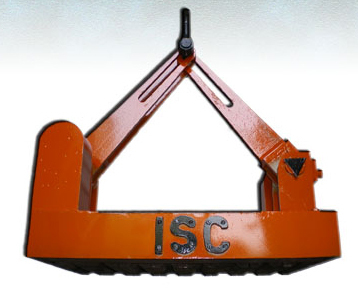 ISC Lifter is suitable for lifting and transporting steel palte at factory, dock, and warehouse and ohter logistic department. When it is used to hoist loads, the top surface of loads shuld be bigger than or equal to the bottom surface of the lifter. The material is permanently magnetic and switching the LF Series on and off to catch and discharge loads is mechanically automatic, therefore no power is required and it has no operating costs. You can use it almost anywhere - just hook it to your hoist or crane. ** It is our endeavour to continuously improve our product so pictures shown above may vary from the original.